A confined space is an area large enough for a person to enter, is difficult to exit in the event of an emergency, and is not intended for regular human occupancy. – Contains or has the potential to contain a hazardous atmosphere. – Contains a material that has the potential for engulfing an entrant. – Has an internal configuration such that an entrant could be trapped or asphyxiated by inwardly converging walls or by a floor which slopes downward and tapers to a smaller cross-section. 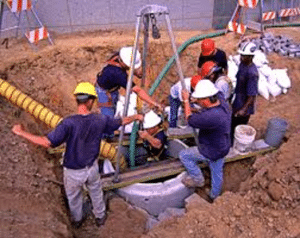 Under the new confined spaces OSHA regulations for construction, training for all employees involved in confined space entry work is required, the competent person must conduct an initial evaluation of the confined spaces to determine if they are permit-required spaces. Continuous monitoring of atmospheric and engulfment hazards is required, permits may be suspended instead of cancelled, provided the space is returned to permit conditions prior to re-entry, also, there is specific information exchange requirements for multi-employer work sites. This confined spaces for construction class is designed for those individuals who will be working in and around confined spaces, covering hazards in confined spaces, duties and responsibilities of authorized entrants, attendants, entry supervisors, permits, non-entry rescue, and the role of the competent person. Please contact Phoenix OSHA Training for more information.